Part One is here. We were served the prawns and the curried fish salad at the same time, so we left the cold salad until after we’d finished the delectable prawns (I scooped up every last bit of that heavenly sauce!). My only criticism of the night was that too many dishes came out at once, rather than being well-paced over the course of the meal. We had just started the salad when the chicken biryani was served. The salad was the dish of the night for me – the curried ocean trout was tender and flaked into perfect pieces, and the cucumber, celery, onion and green beans were incredibly refreshing after the spicy prawns. We saved a bit to finish with, then got stuck into the biryani, which had been cooked until some of the rice was crisped (like bibimbap). 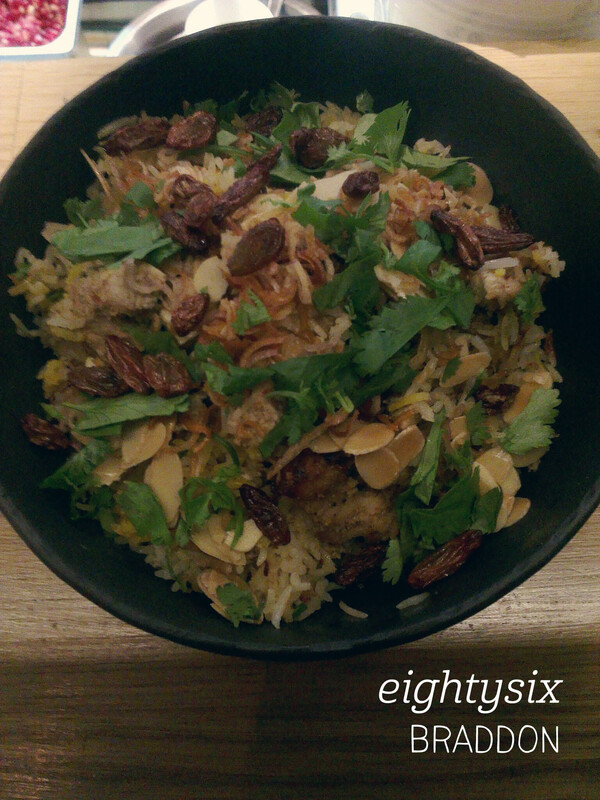 The chicken had some sort of yoghurt coating which was luscious and perfect, and the almonds, herbs and sultanas added hugely to the flavour. Finally, we decided to share a dessert – the coconut sago and mango. We loved the toasted coconut and sesame topping, the pops from the sago pearls, and then deliciously sweet, fresh mango. All in all another spectacular kitchen takeover. Come back again soon? My team organised a lunch at Bookplate, the cafe at the National Library of Australia, which has come under new ownership this year. 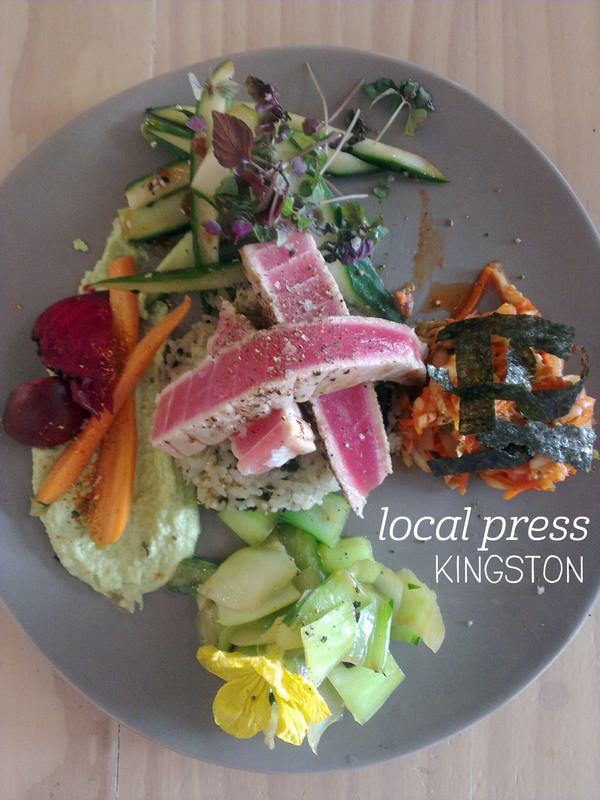 The menu is varied and extensive, making it hard to pick just one thing. 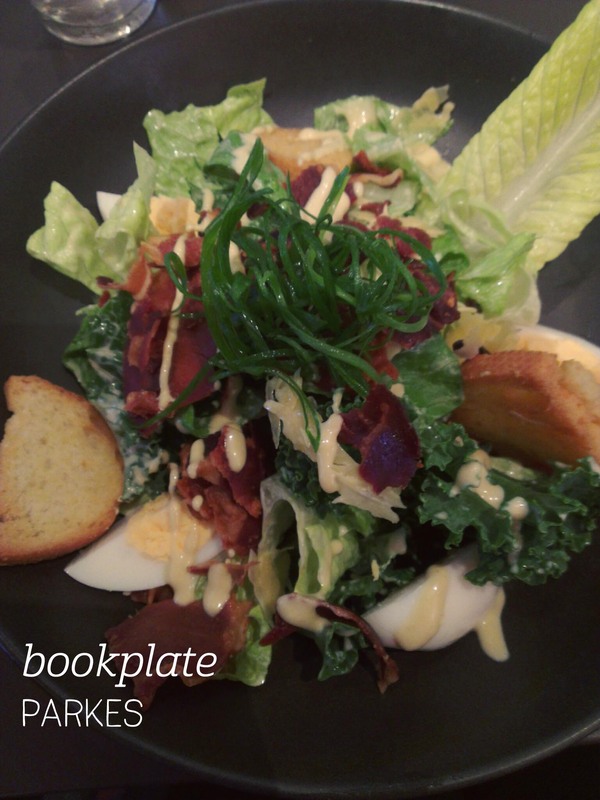 One of my favourite lighter meals is a caesar salad, which was my pick on this visit. Whilst you have to order at the counter, meals are brought out to you – we sat under the beautiful stained glass windows. The salad was elegantly presented in a reasonable-sized bowl. This caesar was all about the individual flavours – the pancetta was beautifully crispy and salty, the lettuce really fresh, and the spring onion added a kick. I am a sucker for good croutons, and these were right up there, although a little hard to cut. My only complaint was the lack of dressing – a good, oily caesar dressing would have gone better than the sparing daubs of a creamy version. For dessert I ordered one of the giant hazelnut meringues in the cake cabinet – it was heavenly! 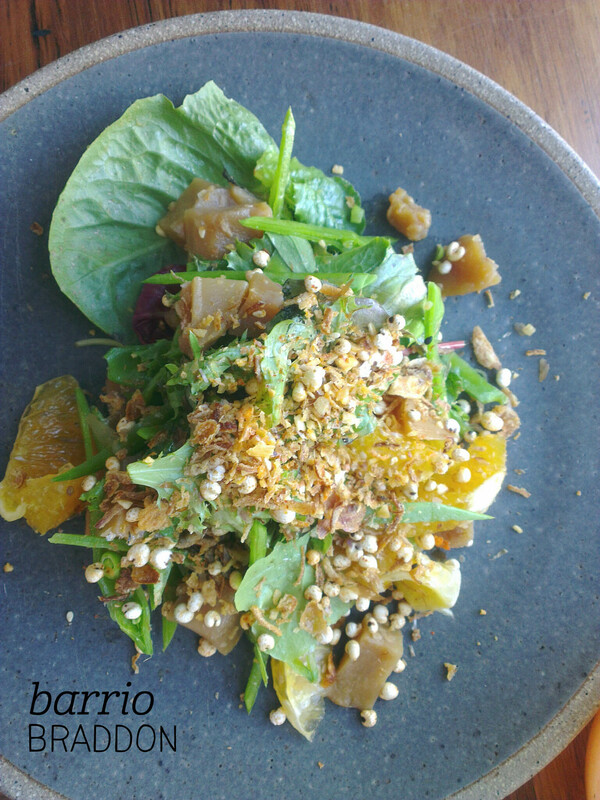 There was a lovely balance of crispy outer and gooey inner and the hazelnut flavour was just perfect throughout. Oh yes, I’ll be back. Good gyoza are an amazing thing. One night I went for a wander and found a particularly good gyoza place, although to be honest the only reason I ducked in was a) they had a huge tiger on the side of the building and b) my brain was tired of translating Japanese and the restaurant’s name was in English. It may have been the best decision of the whole trip. We ate four plates of gyoza on the waiter’s recommendation, plus the tomato and avocado salad. 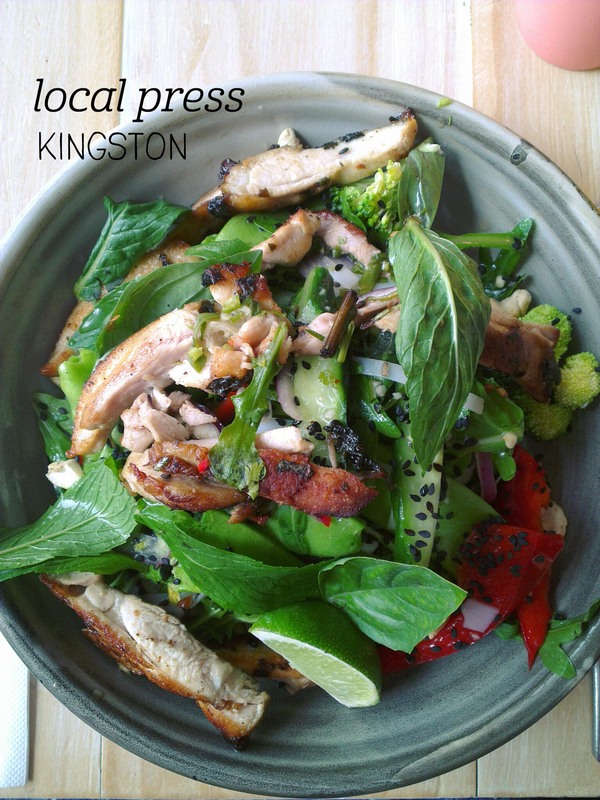 The salad had us in raptures – topped with fresh cress and corriander, the avocado and tomato chunks were doused in an oily corriander dressing – we licked those plates clean. 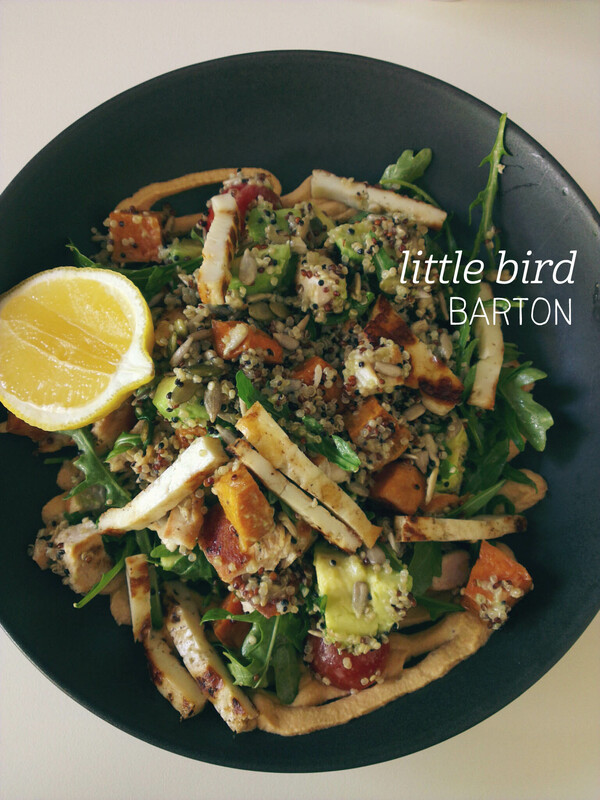 Seriously, seriously good salad. 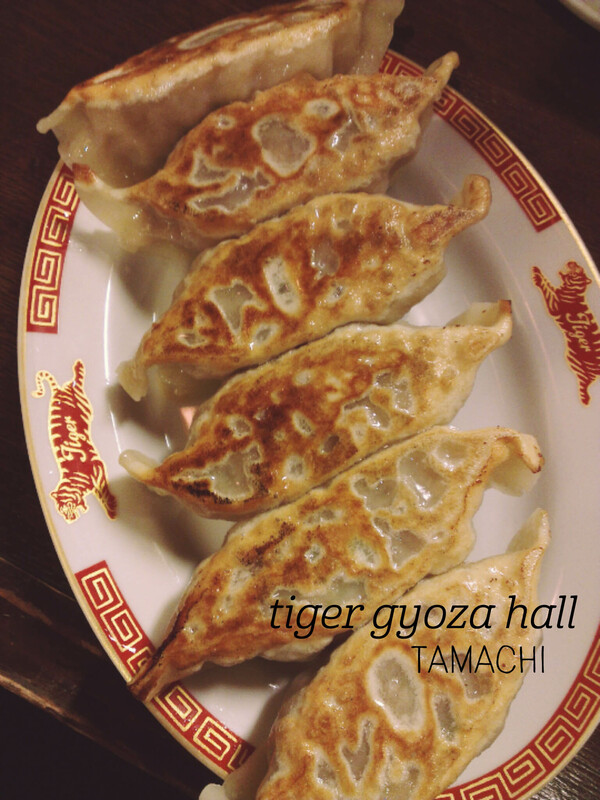 The first two plates of gyoza were equally amazing – each plate had six dumplings – one normal-sized the other giant. The giant gyoza (called bukkuri gyoza) were the pick of the menu – packed with pork, crunchy sprouts and cabbage, they were to die for served with the corriander, onion and chilli condiment sauces. We weren’t as keen on the green soup gyoza which came third, but the yuzu gyoza on the final plate were refreshing and incredibly tasty. We dined here twice on this trip and I will most definitely be back.